I already adored Bryce Dallas Howard and after having the incredible opportunity to interview her this week, I love her even more! Bryce Dallas Howard plays Grace in the movie Pete’s Dragon. This movie is OUT IN THEATERS TODAY — go see it! 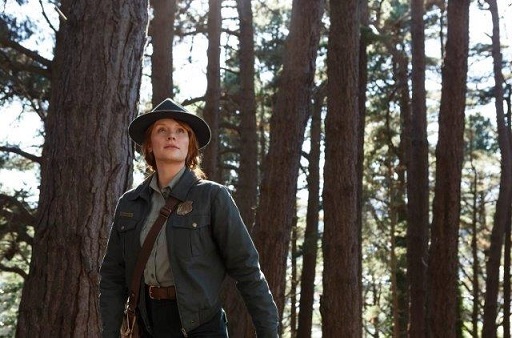 In the movie she plays a forest ranger who has an incredible love for all things nature related. Her father, played by the one and only Robert Redford, tells stories of having seen a dragon in the forest years earlier. The movie is all about opening your mind to the magical, that and family. Bryce Dallas Howard does a phenomenal job playing this character and it was a pleasure to interview her. As Bryce walked into the room, full of us bloggers, you could see that the interview was a pleasure for her. I am sure being interviewed by a bunch of fellow Moms is a different experience for a lot of actors/actresses. She was a TOTAL sweetheart and just very down to Earth and real with us. I loved that you could see how her experience as a mom is portrayed through the film with Pete. Of course we asked her what it was like filming in New Zealand and if she brought her kids. She loved it and fun fact… 30 years earlier she was in NZ with her own father (Ron Howard) while he was filming Willow! So this was a great flash back to her own childhood and she was very pleased to be sharing that experience with her own kids. As with every actor that we interviewed, we asked about the opportunity to work with Robert Redford. In each case you could see appreciation that the actors had with the chance to film with him and Bryce was no exception. She said he just brought a calmness to the set, he was very at peace and comfortable with his acting. And that they would chat about parenting too! I haven’t thought really critically about that question, but my first thought is The Little Mermaid because it came at a time, I think I was in second or third grade. But I mean, Ariel had red hair; I had red hair… It just was one of those movies that just came at one of those moments. I memorized all the songs and I used to do really dangerous things. I would put on a leotard and then I would tie my legs together and I would throw myself in the pool. I did it many times… so dangerous. I actually have a memory of the last time I did this underwater, looking up and thinking to myself “this is really not good,” starting to panic really bad. I don’t think my parents know. I mean they couldn’t have known. Now they’re going to know, but now they know a lot of things. So, I think, I think it was “The Little Mermaid”. Interestingly enough, David Lowery, the director of Pete’s Dragon, said the same thing! Movie is out TODAY in theaters, so get yourself to the movies! Take the kids!